Some of us need to strengthen our emotions and grow, some of us need physical relaxation or to sleep better, some of us need to discover the meaning or purpose of life and some of us just want to deepen understanding. No matter where you fall, or what you need, Meditation teaches us to Relax the Body & Calm the Mind and works wonderfully in a group situation. Some help to uplift feelings and emotions, some teach us how to relax the body and breathe and others calm agitated thoughts. Some can teach us to work through painful emotions, and some simply empower us to function more effectively. A typical week night 'Drop-In' class in the studio. I personally love group classes because they are varied and can reach so many of us and our needs. Not only do you have access to a meditation teacher in front of you, but you can learn from others experiences. When we create an environment of trust and confidentiality, hearing others talks about their inner experiences (and their interpretations of those experiences), their difficulties and successes during meditation can help us too. We can also discover that others are having many of the same experiences, so we are less likely to feel discouraged or inflated. Attending group classes helps with motivation to continue practicing at home. Just like group fitness classes; although our motivation generally comes from within ourselves, some of us need an occasional external boost in order to continue. In comparison with one-on-one classes, CD's or apps. 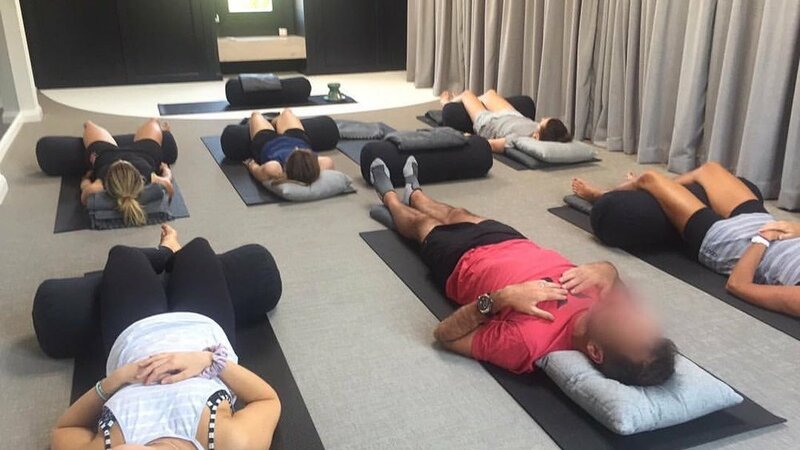 Regular classes means making the time to meditate. A common reason people do not continue with apps - its easy to skip these when we get busy. When you're in a group setting it's scheduled in your diary just like any other appointment. Can deepen your meditation experience because we all naturally radiate the type of energy from those meditative states. In addition to radiating out, we also receive that energy from one another, intensifying our own practice. Even though we walk down crowded streets or work in a busy office, we now live much of our lives separate from others. Technology and social media and the fast-paced society we now live, we may 'feel' more connected in some ways, but "human moments" of actual face-to-face exchange without interruption have become rare and group classes provide this interaction and connection. You feel more connected to other people who share a similar interest in self development and of course to yourself because you’ve sliced out an hour of your day to connect together and with yourself. As well as introducing and teaching different techniques, leading through guided tailored meditations, you will feel support with any questions you might have. Direction to apps and ongoing material and a face to email whenever you may have a question in future practice is always helpful. If at all else ... sometimes the sheer experience of the silence shared during meditation can be enough for some of us. Or the act of taking just one deep breath that reaches your belly throughout your workday !